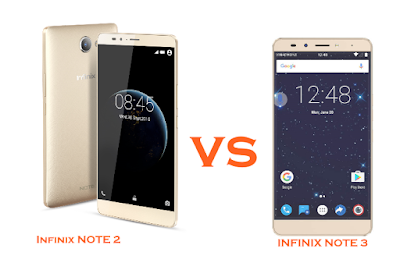 Today we will do a comparison review, that will focus at the specifications and features of the Infinix NOTE 3 versus NOTE 2; or Note 2 VS Note 3, which ever you want to put it. We won't deny that Note 2 was a great smartphone with its on setbacks, (check out the review here ) but the Note 3 is causing waves already, there are smartphones that you just can't wait to see what they would bring next after a predecessor, most of us are expecting impressive changes but did Note 3 really accomplish that? We will decide after having a look at the similarities and differences between these two phablets. The memory of Note 3 is quite a turn off, it's still the same as that of Note 2, potential users may have been expecting something with a 3GB RAM and 32GB ROM or more but we didn't see that. Perhaps the Infinix Team will consider that in another series of their coming models. The design of both of the phablets still look alike, the tiny change was done on the back of the Note 3, and we think that of the Note 3 looks much better and cooler to hold. The display on the Note 3 as seen in the specs will definitely have a more crisp display, Note 3 supports 4K videos. Note 3 definitely wins at this, unlike XUI on Note 2, XOS is really slicker with more design qualities and functionalities for users and it comes with a much updated Android version, Marshmallow. The rear cameras of both of the devices are the same, although we do not have proof of testing them, the front cameras 2MP for Note 2 is not as good as that of Note 3 because the Note 3 has 5MP front cam, and will definitely be optimised for better performance. Do you think Note 3 is worth using over Note 2? You may tell us anything you think about these devices below.